Heads up! Ubilinux is no longer maintained, although it can still be downloaded here. We also recommend checking out jubilinux as an alternative Debian distribution for the Edison. If you have been playing with the Edison, you might have noticed that the Yocto Project can be difficult to work with. Namely, they want you to re-build Linux from scratch every time you need to enable a package. This is great if you are making the Edison into end product, and you need a fast, stripped-down version of Linux. However, if you want more features and a full-fledged package manager, it is worth installing a different version of Linux on the Edison. For this tutorial, we are going to install Ubilinux on Edison and enable a few important features (like WiFi). Ubilinux is a custom Linux image based on Debian. This version of Linux was used in the SparkFun Live! episode Tweeting Turkey Temperature Timer. 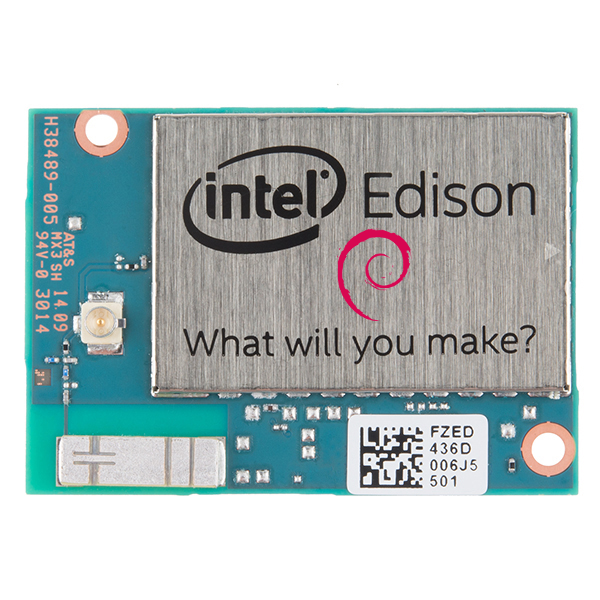 You will need an Intel Edison and one of the boards that allow you to re-program the Edison, such as the SparkFun Base Block, the Mini Breakout Kit, or the Arduino Breakout Kit. IMPORTANT: You can potentially brick your Edison by following this tutorial. Do so at your own risk! Be especially careful at the part where it says to not unplug your Edison for at least 2 minutes. If you do brick your Edison, read the Troubleshooting section for possible solutions.